Tucson, AZ (December 1, 2018)- A man suffered serious life-threatening injuries following a motorcycle accident in midtown Tucson Saturday Evening, December 1st. 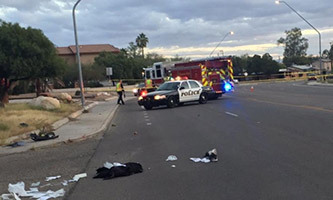 According to Tucson Police Department, the motorcyclist was injured in a single-vehicle accident at the intersection of Euclid Avenue and Edison Street. No other information was made available at this time. The motorcyclist was transported by ambulance to Banner-University Medical Center where he is being treated and was listed in critical condition. Officers did shut down Euclid Avenue at Edison Street for a few hours to continue the investigation.